I love pure coconut and use it in many of my recipes. Shredded coconut flakes are made by grating and drying mature coconut pulp. In parts of Asia, coconut is called the Tree of Life or the Tree of a Thousand Uses. Coconut has been enjoyed since ancient times for its pulp, meat, oil, and leaves. Coconut forms the basis of many of my recipes. This simple ingredient can be used to make delicious main dishes, cakes, cookies, mousses, ice creams, and more. I use pure, full fat shredded unsweetened coconut flakes. Processed, de-fatted flakes are low in flavor and nutrition, and will not work in my recipes. Shredded unsweetened coconut is widely available in almost any grocery in the bulk section and also in packages. I suggest you use either the medium or fine gauge shredded coconut, not the large flakes. Make sure it is unsweetened and contains no other ingredients. 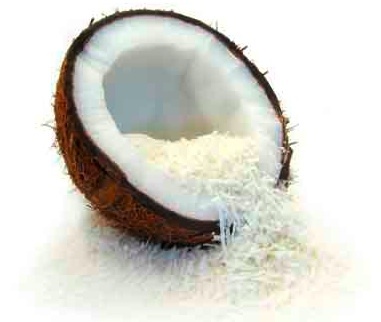 I recommend full-fat shredded coconut, not packaged coconut that has been de-fatted using heat and/or chemicals. De-fatted coconut is lower in nutrition and flavor, and it is no longer a whole food. However, pure shredded unsweetened coconut is divinely delicious, 100% Paleo and a complete whole food. Hooray! Click below to order.